Michael Caine is set for a return to the Porsche Carrera Cup GB grid this coming weekend, making his homecoming to the Motorbase Performance squad for the 2018 season finale at the team’s home circuit, Brands Hatch, on September 29/30. The 2012 British GT Champion and 2010 Carrera Cup GB runner-up will pilot the Kent-based outfit’s 2nd911 GT3 Cup Car for the final two races of the season. 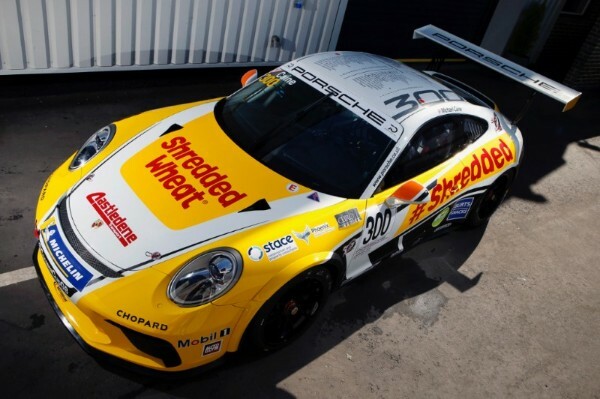 Running under the #300, Caine’s car will showcase a specially commissioned livery to celebrate the 300th Porsche Carrera Cup GB race, featuring the names and number of victories of every race winner since the series’ inception in 2003. Motorbase and Caine have a long-standing relationship with the German marque. After initially joining the Carrera Cup GB grid in 2004, Motorbase competed at the very top of the Championship for seven seasons, notching up an impressive 26 race wins in that time – the third highest of any team in the championship’s history. Having driven for David Bartrum’s squad from 2009-2014, 49-year-old Caine amassed a total of 14 Carrera Cup GB race wins, ending the 2010 season as Vice-Champion before going on to claim the 2012 British GT Championship title with Motorbase in the Porsche 911 GT3R. “I remember the Carrera Cup GB from the beginning;” commented Team Principal David Bartrum. “Obviously we weren’t there from the very start. We joined in 2004 in the 2nd year as a team and had a great run through to 2011 with many successes along the way. “It’s a fantastic series and to think it’s got to 300 races so quickly and we’ve been a part of quite a few of those is quite something. With it falling at our home circuit, we felt obliged to do something a little bit special to mark the occasion. It felt right to bring one of our old Carrera Cup drivers Michael Caine back for the occasion. Newmarket-based Caine added; “It’s a fantastic opportunity for me to be able to jump in the Motorbase car this weekend. We’ve always joked about me retiring in a pair of Motorbase overalls and this meeting is the last race of the season so who knows! The Wrotham-based team arrives at the iconic GP circuit in a fighting second place position in the Pro-Am Championship standings. 22-year-old rookie Dan Vaughan has made an impressive showing on his debut season, collecting 5 race wins and 8 podiums from 14 appearances and heads into the final two races of the year just 7 points adrift of current leader, Seb Perez. The final two rounds of the 2018 Porsche Carrera Cup GB Championship take place on the world-famous Brands Hatch GP Circuit on September 29/30. Qualifying for round 15 – the 300th Carrera Cup GB race – takes place at 13.05-13.35 on Saturday 29th September, with Sunday 30th September hosting the final title-deciding races of the season at 10.40 and 16.40.